Base Quantum CEO, Duncan Hughes-Phillips, is set to speak at the International Bar Association’s ‘6th Construction Projects from Conception to Completion Conference’ in Brussels on Friday 15 September. Duncan will be on the panel ‘Assessing disruption: different methods and do they matter?’ alongside industry players such as: Clyde & Co, Pinhero Neto Advogados, and Fox Rothschild. The panel will explore which methods work best internationally for presenting and proving disruption claims. Are FIDIC forms worth their popularity? The importance of the applicable law. How far do lawyers from civil law and common law backgrounds view the same construction law issues differently? Assessing disruption: different methods and do they matter? Solving disputes under different arbitration rules: does it matter and is there a ‘best choice’? Base Quantum are also proud to be the headline sponsor for the conference. 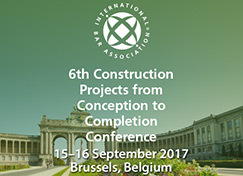 The ‘6th Construction Projects from Conception to Completion Conference’ runs from 14-16 September 2017 at Hilton Brussels Grand Place, Brussels, Belgium. You can find out more about it here.